Since halloween I seem to have not done much other than eat – not that I am complaining. As a group we got together with our families and had a very nice halloween all together at a party at my home. My wife did us proud with a super feast of all things traditional and my Indian colleagues wanted to know how I had carved my pumpkins – they wanted some for their festival so I offered to carve some more but I know they will not want minecraft and witchy ones I did for my kids. Not sure what to do – any suggestions welcome. As we are a mixed cultural, ethnic and religious group we try to appreciate and understand each others customs with an open heart and mind. This month has seen and is still seeing many festivals and observances from different religions. This is the month of Muharram in the Islamic calendar, we recently had Yom Kippur (20th Sept) the Jewish Day of Atonement, the 5 days Hindu festival of Diwali starts on the 9th November, this festivals celebrates the victory of good over evil. In Turkey a dish called Asure is made, this is also called Noah’s pudding and is said to be when Noah was starving on the ark and only had remnants of grains and bits of food from Noah made Asure and saved all from starvation. Christian communities in the east also make a similar dish I have been told called hedik, amah, or qamhiyyi. The dish is normally made at home and shared with all neighbours and let me say it is very tasty – a little sweet for my tasted but mine had fresh pomegranate seeds in that gave a nice bite to it. The Festival of lights is a major celebration for some of my colleagues whom have invited us to share this with them. I am really looking forward to this but have been warned that there will be lots of festival food -I can’t wait. I feel very honoured to be sharing this time with my colleagues and their families, I feel it is something we should all do more of. 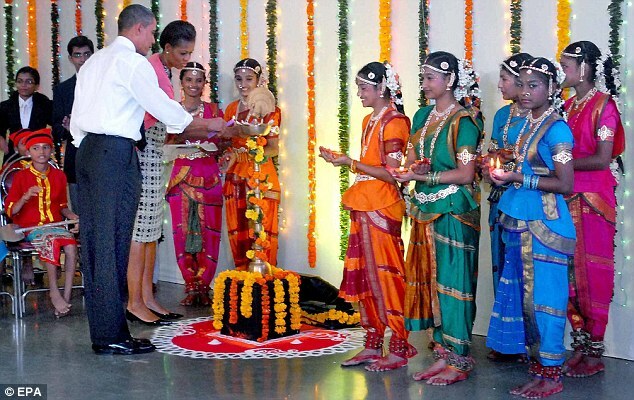 President Obama and his wife are currently in India so will have chance to see the festival in its home country. I respect how he has offered a recognition to the different beliefs and cultures here in America, last year So if offered the chance to share one of these special times with your neighbours I suggest you take it – the warmth, the welcome and the chance to understand a little more about their lives and beliefs.